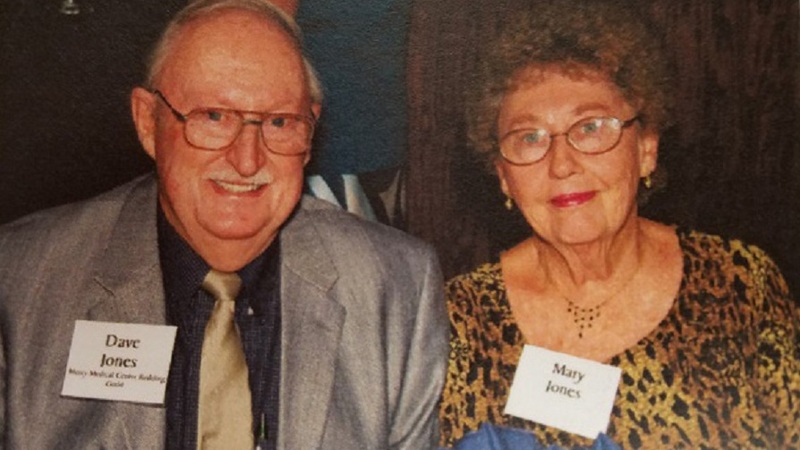 Just a few months ago, Mary Jones said goodbye to the love of her life, Dave, after they had been married 65 years. She credits Hospice for helping her make their farewell as comfortable and special as possible. Dave and Mary were married in Kansas soon after they graduated from high school. They raised a family of three while Dave worked for the federal government. After retirement, they traveled in their RV for several years and eventually moved to Redding, so they could be close to one of their daughters and to good healthcare. Here they joined the Mercy Guild. Dave volunteered for eight years, including serving as President of the Guild. Mary has been a volunteer for more than 12 years. When Dave's health dramatically declined, the couple needed to make some tough decisions. "First Dave's cardiologist and later his primary physician encouraged us to consider bringing Hospice into our home," Mary recalls. "It's hard to do and it's hard for the patient to accept it." They knew it was time. The Hospice social worker helped Mary set up their home for equipment and shared what to expect. The nurses attend to Dave's every need and showed Mary and their daughter how to make him more comfortable. "Our nurse, Beth, was very personable, friendly and outgoing. She listened to us. You know, Hospice nurses have a special calling," Mary says. Their chaplain, Ray, provided spiritual support. Patricia, a Hospice volunteer, stayed with Dave so Mary could go to mass on Sundays and continue to volunteer on Fridays. Hospice staff provides reassurance to the family. "They prepare you for what is going to happen next. They were so gracious. When I called, the nurses always answered my questions or just talked with me. On Dave's last day, a nurse visited me before he died and another came after he died. I just cannot get say enough about how special Hospice is."